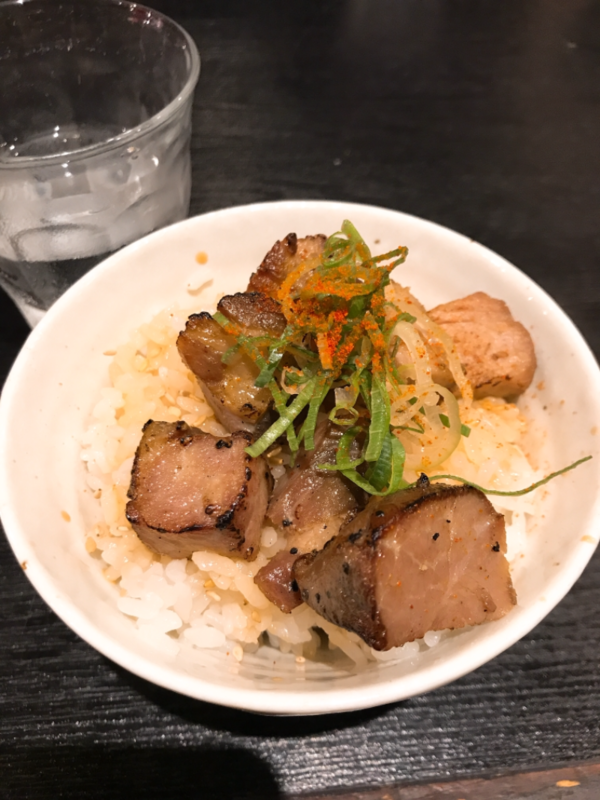 Menya Ikku is a restaurant that is a 1-minute walk from JR Nishioji Station. The ramen-chef of this restaurant, Mr. Sasaki, started working at Japanese restaurants when he was 18-years-old, so he has a lot of experience. But even though he is this experienced, he is always trying new things with ramen. On his days off, he goes to different restaurants to find inspiration for his ramen creations. The ramen made by Mr. Sasaki has its roots in traditional Japanese cookery, with a basic feel to it, but there is something new in it too. 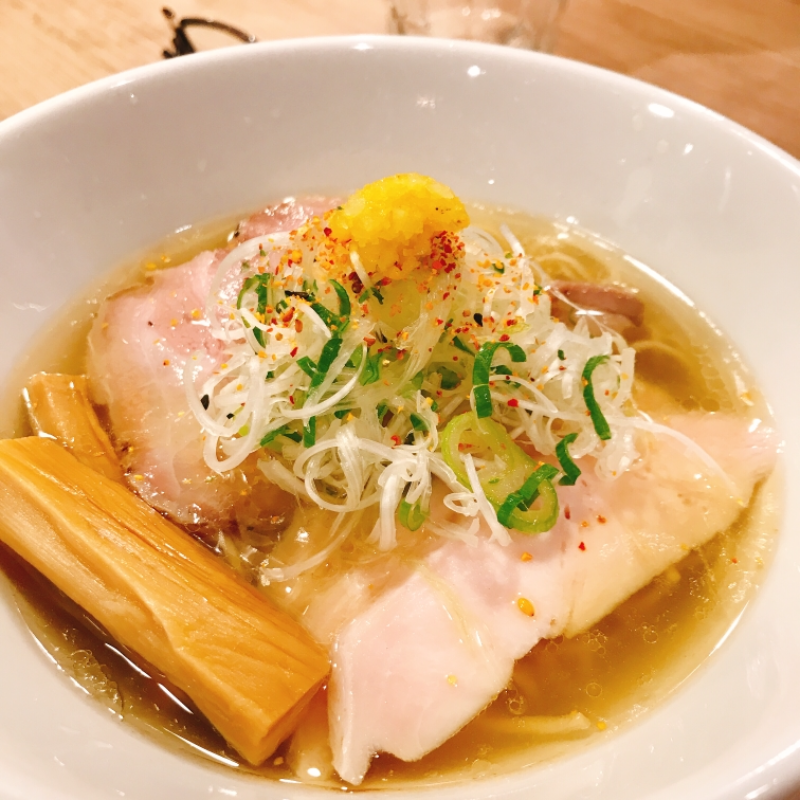 Menya Ikku offers three types of ramen: Chicken paitan, chicken shoyu, and shio ramen. They also sometimes have specials. 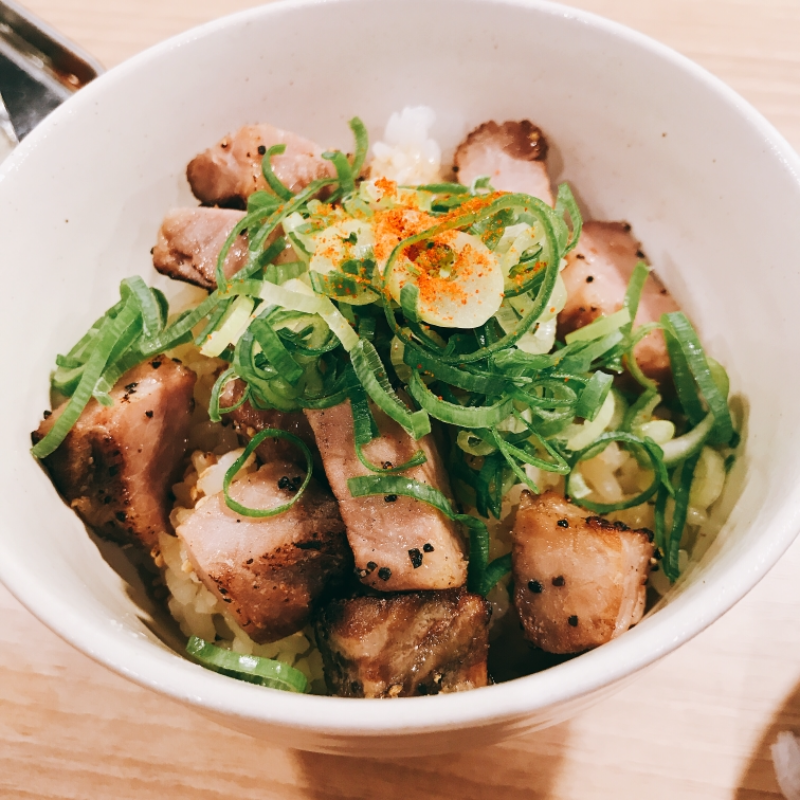 The ramen is not only delicious but also surprising; there is always a new discovery to be made in the ramen at Menya Ikku. 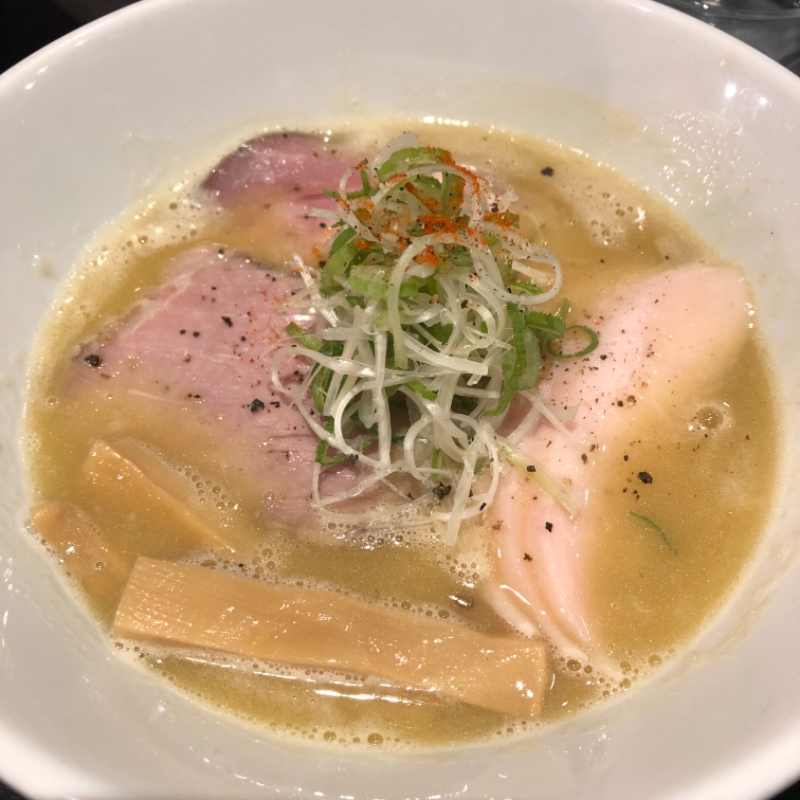 This is because the chef, Mr. Sasaki, balances the soup and the ingredients perfectly, even changing the noodles to fit the soup, and when you add his experience to this, it makes for a beautiful bowl of ramen. There were not many ramen restaurants in the Nishioji area, so it’s nice that there is a ramen restaurant of this level here now. So Menya Ikku is a great place for those working in this area. 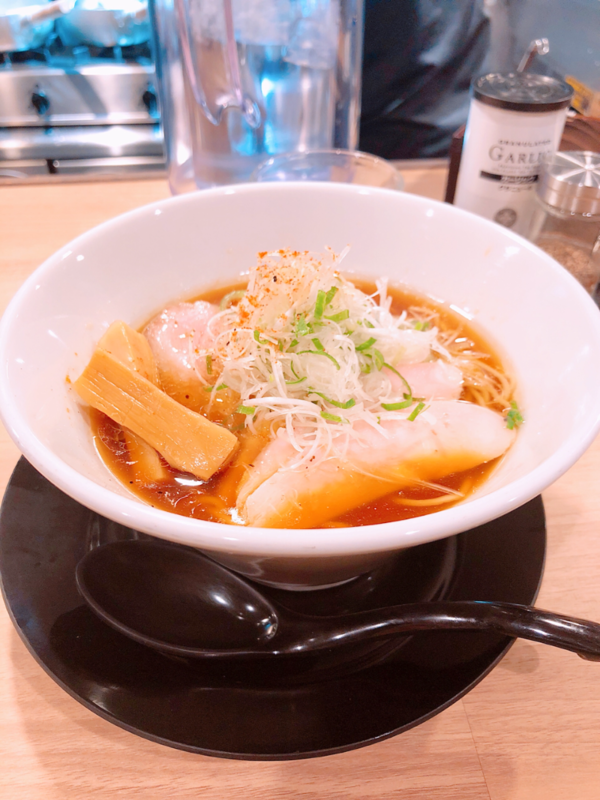 The restaurant uses a lot of black in its interior design and has a chic and modern atmosphere, and the staff is quick and friendly when serving you with your ramen. This is the most popular ramen at Menya Ikku, with a milky smooth texture and umami punch. The chicken stock is made using Nagoya’s famous Cochin chicken, so even if you just have a spoonful of the soup, you’re completely surrounded by the rich umami of chicken. The gently boiled soup has a nice richness to it and goes well with the shoyu tare of the ramen. The noodles are medium-thin, boiled slightly al dente, and go together with the soup nicely. The crunchy onion, black pepper, and ichimi-chili are a nice accent to the mellow-tasting soup, so it’s easy to finish the soup to the last drop. This umami-filled chicken paitan ramen by Menya Ikku is something every chicken paitan fan is going to want to have a second bowl. 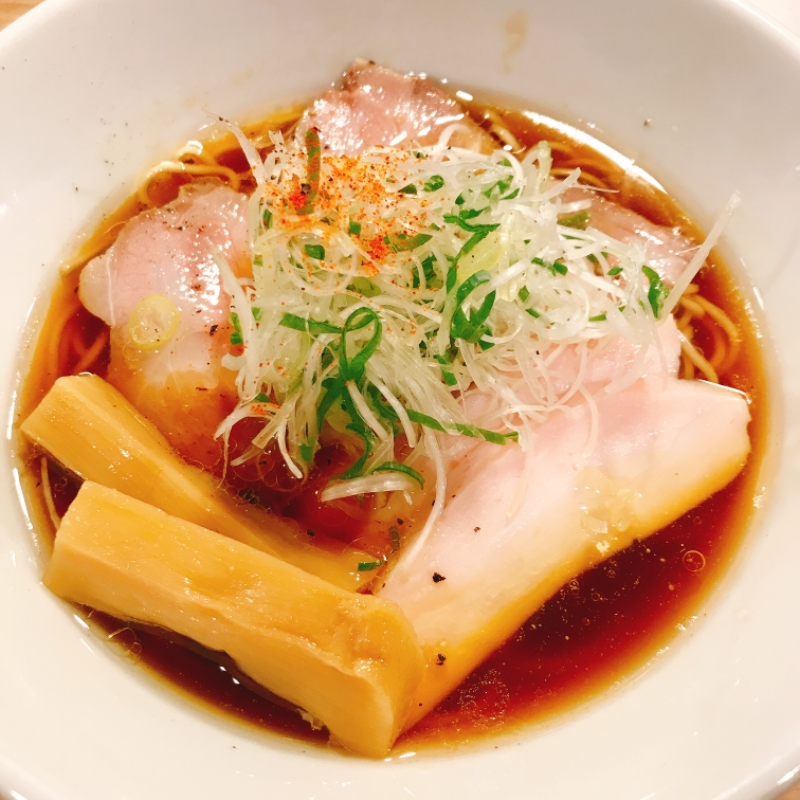 The specialty of this shoyu ramen with its clear soup is its refined umami. The shoyu tare is made by mixing five types of soy sauces, and the taste is light, but the umami and fragrance of soy sauce stand out. But it’s not too strong. The noodles are thin with a nice taste of wheat. Because the noodles are thin, they’re easy to eat, and it’s hard to put your chopsticks down. Luxuriously, there are four soft and juicy, a bit rare, chashu slices on top of the ramen, two chicken and two pork. They’re full of meaty umami eaten just as they are but even better if you savor them with a little bit of the soup, as this way you get to also enjoy the taste of the soy sauce. This bowl of ramen is of such quality that everyone is going to be amazed by its taste. This beautiful ramen with a clear soup is called shio ramen. The tare used in the soup is made by blending three types of salt. The very high-quality soup is full of the umami of chicken and seafood, and the seafood stock is made by using konbu (kelp), small dried sardines, mackerel, red-eye round herring, and auxis in it. The chicken paitan and shoyu ramen this ramen is also topped with four chashu slices. Here too, I recommend eating the chashu with a generous slurp of the soup. The finely sliced lemon on top of the ramen works as a nice citrusy accent and lets you enjoy the ramen to the last drop. The cool salt and lemon soba with fragrant dashi is an only-in-summer ramen that even looks refreshing. Unlike the ones above, this ramen is cold and great for a hot summer’s day. Cold ramen is not something you often hear about, but once you have a spoonful of this, you’ll surely be left wanting more – it’s so delicious. Unlike most ramen noodles, these noodles are not round but square-shaped, and they have a nice chewiness to them and a very nice texture. As you can probably guess from the name, the soup contains Japanese dashi and lemon tare. Unlikely for ramen, this bowl is topped with olive oil, but surprisingly this really does go well with the soup – the nice fragrance of olive oil hits your nostrils just before you start eating the ramen. Add lemon to this, and you have a ramen with a light taste. The chopped onion and red onion add their crunchy texture to the ramen and make the bowl even more refreshing. First, buy tickets from the ticket machine. 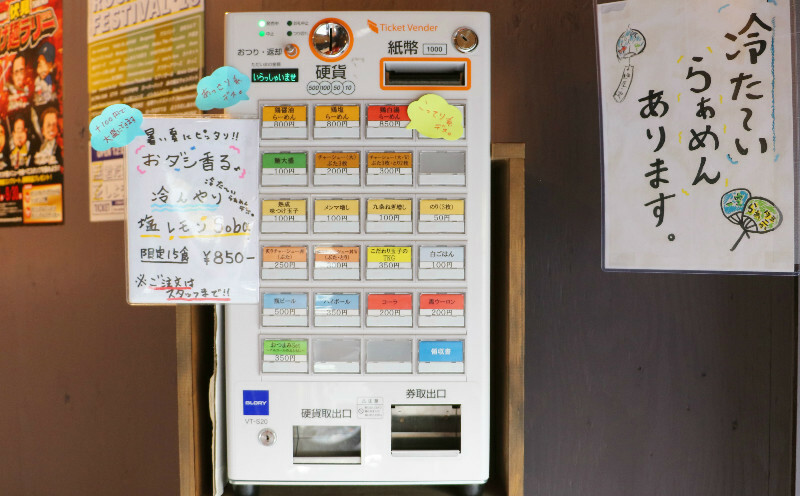 Put money into it, choose your ramen, and press the button. They have no English menu so I recommend deciding what you want to order beforehand. Note that the ramen tickets are bought when you enter the restaurant. Take care not to cut the line – wait for your turn to buy the tickets. All the side menu items at Menya Ikku are also delicious so if you’re feeling hungry, please order some. I recommend their TKG (tamago-kake-gohan, or rice topped with a raw egg). 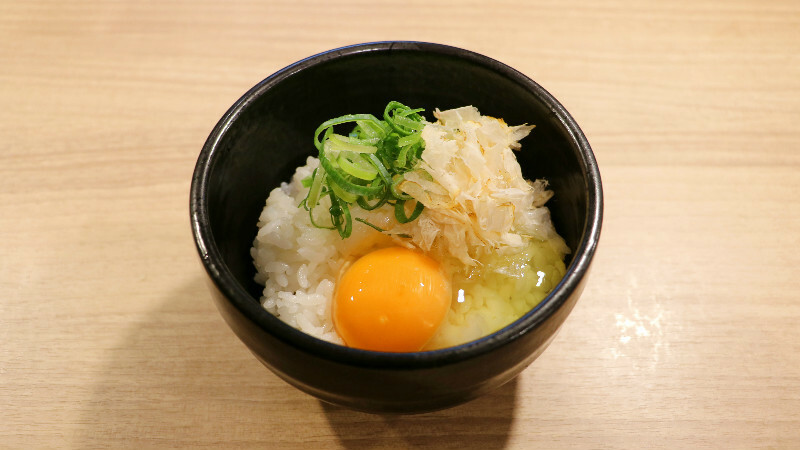 The rice bowl is, besides the raw egg, also topped with green onion and chicken flakes. The chicken flakes are made by shaving specially processed chicken. As you bite into it, you get a mouthful of chicken umami, and as you chew on it, the umami just gets stronger. The egg and chicken shavings go really well together, and the fragrant chicken flakes make the richness of the egg stand out even more. My recommended way of eating this dish is not to mix everything together, but to first carefully break the yolk, and then pour some soy sauce on it, and then carefully mixing everything together, but not too strongly. TKG may not be something popular overseas, but the TKG at Menya Ikku is especially tasty and they use only the finest toppings. Recommended especially for those who have not had TKG before. I like ramen and often go to eat ramen, but I don’t really know that much about ramen. But here, from the moment I had my first spoonful of the ramen, I was surprised by its deliciousness! Actually, it was so good I started to think of my next visit as soon as I left the restaurant (lol!). 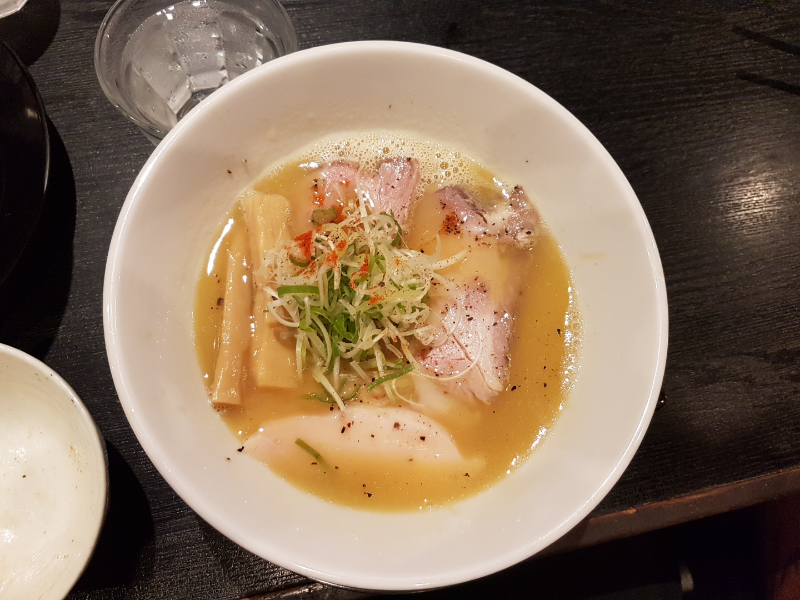 The ramen at Menya Ikku does not only have delicious noodles, soup, and toppings, but the balance of the ingredients is great, so this ramen feels like a finished product. But among these different types of ramen, my recommendation is the chicken shoyu ramen. I cannot forget the deliciousness of the wheaty taste of the noodles, the umami of the soy sauce, and the best soup as I slurped on them. The staff was also kind and I felt welcome. My recommendation for delicious ramen in the Nishioji area. Menya Ikku is the “second brand” of Mr. Sasaki, who is also the person behind the popular ramen restaurant in the Fushimi Chushojima area of Fukakusa Seimen Shokudo. I have eaten innumerable bowls of ramen in my life, but I feel that Menya Ikku is a quality restaurant in many ways – one of the best in Kyoto. I want to give a special mention to their chicken shio ramen. Shio ramen is something where it’s very hard to make something unique and different from other shio ramen, make the umami stand out. Shoyu and miso ramen already contain the umami of soy sauce and miso, so making them taste good is easy, but with shio things are not so simple. You need to pay a great deal of attention to the ingredients in the dashi stock, how much tare you put into the ramen, the choice of noodles, and the temperature of the soup, as the taste of the ramen fluctuates based on these factors. You need to be very careful in controlling these things, and it takes a profound knowledge of ramen to make good shio ramen. These things are carefully calculated out at Menya Ikku, and I can vouch for the quality, as I think the shio ramen here is the best light shio ramen in Kyoto, as far as I know. 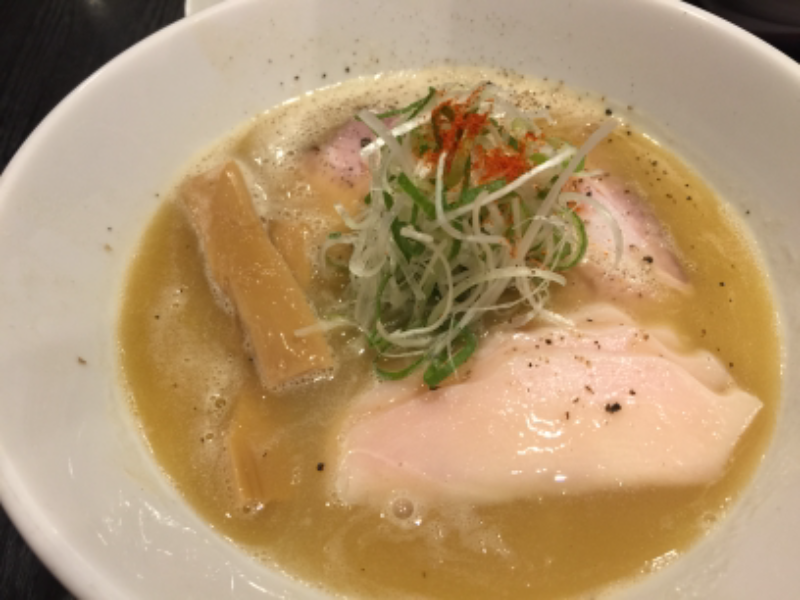 The most popular ramen at Menya Ikku is chicken paitan ramen, but I recommend the chicken shio ramen. If you come to Menya Ikku, please try both of them. A 1-minute walk from JR Nishioji Station. 11:00 a.m.-2:30 p.m. 5:00 p.m.-10:30 p.m. Only open for lunch on Sundays, closed for dinner. Open every day unless otherwise noted (check Twitter). They only have their menu in Japanese, but they can speak some simple English.